I was just reading a Facebook post where someone had reminded other riders to change the batteries in their key fobs at least once a year. I’ve never changed mine, so it was a good reminder for me. Who else has some good tips for getting ready for the new riding season? Leave your comments here, or share them at our next Chapter meeting. An “old” feature from the OCBHOG website is now a “new” feature for the DHDHOG website. The mileage tracking database is now available for members to track their mileage for each of their bikes (Harley’s only!) for the current riding season. By recording your mileage throughout the riding season you can contribute to the Chapter’s annual mileage goal. 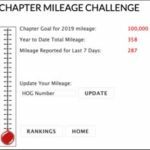 The mileage tracker will allow you to see the mileage rankings of each Chapter member so you can see where you stand in comparison. To use this feature you must provide a Chapter officer with your odometer reading for each of your bikes at the start of the riding season. Once a Chapter officer has recorded this in the database you can access the feature by clicking on the Chapter Mileage Challenge link under the MEMBERS ONLY menu on the website. Enter your HOG number and then simply enter your latest odometer reading and then click on the SAVE button. The website is ready, now let’s hope for warmer weather to start putting some miles in the database! Great rides are not like great fishing spots. People normally love to share their favorite rides with their friends. So, what are your favorite rides? The Chapter would like to hear your suggestions for rides of any length. One or two hour rides. All day rides. Overnight rides. All ride suggestions are welcome. Share your suggestion by either responding to this post below, emailing one of the Chapter officers, or just bring it up at the next Chapter meeting. Please leave a comment if this is helps, or if it doesn’t work for your device. How safe of a rider are you? It doesn’t matter how long you have been riding. There is always something new to learn when it comes to safely riding your motorcycle. Check out the new safety question on the Safety Information page to see if you can answer the question at the next Chapter meeting. Also, if you have safety tips or questions to raise with your fellow Chapter members feel free to leave a comment on this post. Or, email your tip to headroadcaptain@dhdhog.com. Reminder that our Chapter Meetings have been moved to Saturday mornings. Our first Saturday meeting will be this Saturday at 10:00 am. Mark your calendars and let’s all show up to hear the latest Chapter plans! This is an exciting time for all of our family in our HOG chapter. We are starting a new chapter and it will be named DHD Omaha Chapter Nebraska. Our new dealership, Defiance Harley Davidson has a whole new outlook on how a dealership should be run and is bringing new excitement, new ideas, and a new way of doing business in the Omaha area. It is only fitting that we have a new HOG chapter to go along with that. 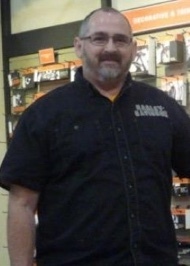 I would like to say “Thank you” to Holstein’s Harley Davidson for all that they did for the HOG chapter in the past 28+ years. Also a special “Thank you” to the charter members, and all the rest of the members of the Omaha Co Bluffs HOG chapter for the dedication, commitments, support, and memories of the first HOG chapter in the Omaha area. I personally have met many people from this chapter in the past 16 years of my HOG relationship and many of them I consider some of my best friends. My wife Kim first talked me into coming to my first Omaha Co Bluffs HOG chapter meeting in 2003.We have been involved with HOG as officers and members of what will now be four different chapters. It becomes a way of life and I love not only the riding, but also the friendships that develop. Defiance Harley Davidson will be giving us a jump start for the new chapter. We have put in an order through Norscott for several items. If you are a current paid member of Omaha Co Bluffs and have a rocker in either the large or small size, Defiance H-D will exchange it for a new DHD Omaha Chapter Nebraska patch at no charge. And since this is a new chapter, anyone joining now and until the end of the year will become Charter Members. We will also have a Charter Member patch for sale that you can add to your vest. The dealership is also giving us 2 new chapter flags. We have also ordered shirts for women and men, hats, and other patches that will be for sale at the dealership. Let’s show some pride and excitement to our new dealership and let them know the people from Nebraska know how to be part of a HOG family.